Artistic facelifts in store for downtown? 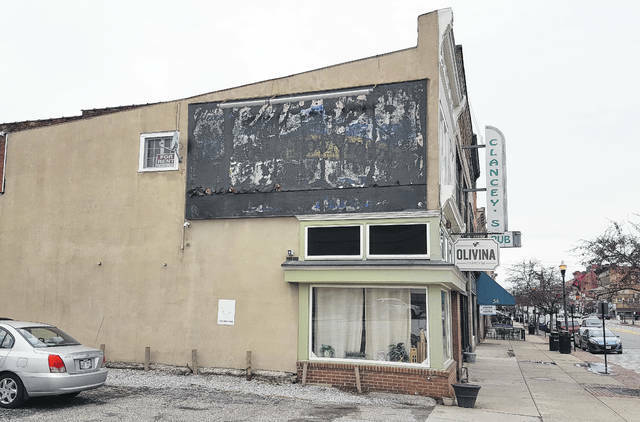 Spearheaded by the Ohio Wesleyan University’s Richard M. Ross Art Musuem, a project is in the works to tranform blank canvases like the side of the Olivina Taproom building in downtown Delaware, pictured, into works of art. Erin Fletcher, executive director of Ohio Wesleyan University’s Richard M. Ross Art Museum, is on a mission to transform some of downtown Delaware’s exterior walls into works of art. “What we would like to explore is working with San Francisco-based artist Brett Cook to do some community-led mural development — public art — in downtown Delaware,” Fletcher said. To incorporate more art into downtown Delaware, Fletcher approached Delaware City Council on Feb. 12 to unveil a project in which Cook would be commissioned to create two to three murals. The project, which Fletcher said is just in the early stages, would be spearheaded by the Ross Art Museum in collaboration with the city, local community, Main Street Delaware, City of Delaware Historic Preservation Committee, The Arts Castle and the Ohio Arts Council. As for the proposed locations for the murals, Fletcher said she has had initial talks with the owners of Olivina Taproom and the Strand Theatre, both of whom have interest in hosting a mural. A third location has yet to be determined. “It’s my understanding that this (project) should not negatively impact our historic buildings in downtown that we’ve worked so hard to maintain,” Fletcher said. As for what the murals might look like, she added that would be up to those who know Delaware best. She added Cook’s mode of working is by gathering groups of community members and getting input from them as to what’s important to the city and what should be incorporated into the murals. Both the mayor and manager of Delaware spoke out in favor of the proposed project presented by Fletcher. Mayor Carolyn Kay Riggle said bringing more art to the downtown Delaware has certainly been a long time coming. “We’ve only been talking about this for about 20 years now, I think, so this is very exciting,” she said. City Manager R. Thomas Homan echoed the mayor’s comments and added having a partner in OWU is a win-win for everyone involved. He added there are various spots throughout the downtown area that could benefit from a little artistic facelift. While it’s no secret that downtown Delaware has a lot going for it, Homan said the addition of two to three murals will only help to enhance the downtown experience for visitors as well as those residents who call the city home. Fletcher added while the project is just in the planning stages, she is hopeful that the work can be completed without having to ask the city for any financial help.